The day after “Bill Nye Saves the World” premieres on Netflix on Friday, its eponymous host is off to headline the country-wide March for Science. Nye’s been named the event’s honorary co-chair, which means — according to him — he can go to Starbucks with the title and get a coffee for five dollars. In other words — it doesn’t change his regular joe status. But the thing is, Nye is no regular joe. 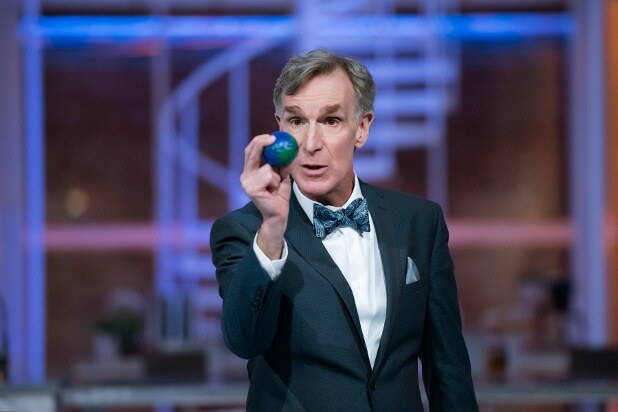 Bill is arguably best known for hosting the popular children’s show “Bill Nye the Science Guy” in the mid-1990s, but his history since then has made him a headliner in the climate change conversation. He has been a part of a few tense debates concerning the realities of climate change, and he’s only going to talk about it more on his new show, much to the chagrin of people who may not want to hear it. “Bill Nye Saves the World” seeks to help its audience tackle scientific issues with a critical eye. With the help of guest stars such as Zach Braff, Karlie Kloss, Tim Gunn and others, Nye and his “correspondents,” as he calls them, go around the world exploring topics such as alternative medicine and climate change — things that have scores of believers but no basis in science. In one episode, Nye and his team address the spiritual practice of walking on burning hot coals. While people pay for retreats to learn how to do this, Nye proves that it’s possible mostly with physics. “People will charge you $5,000 for a weekend where you learn to be spiritually prepared to walk across wooden burning coals. You don’t have to do that, you can just walk across wooden burning coals,” he exclaimed. In another, he highlights alternative medicine practices, seeking to educate people on the realities of the industry in a literal sense. These methods of healing may have mental effects but for Nye, there’s no basis in science. While he’s interested in how things look now, he’s also looking to the future. In the interview, he mentions his fascination with self-driving cars and artificial intelligence, predicting that by April 2034, driving a car will be a skill like horseback riding: only a select number of people will know how to do it. Through his work both on the show and off, Nye seeks to teach people how to think critically. He realizes that people have a cognitive dissonance in regards to certain issues like climate change — understandable to him considering how isolated certain parts of the United States are and how belief systems work, he says — but he hopes that people can learn to use reason. In the meantime, you can watch his show, which premieres Friday at midnight, or you can attend one of the many March for Science protests happening around the country on Saturday. “We’re going to have bands and happy food trucks and inspiring speeches from thoughtful, hilarious people,” he said.